With our upcoming Animals, Collected exhibition and Game of Thrones returning in April, we went on a dragon hunt to spot some flying creatures in our collections. Dragons are found in art and architecture around the world, symbolizing a range of themes and ideas, including the triumph of good over evil, the protection of valuables, and an omen of good fortune. Designed for Herb Cottage, Washington National Cathedral Collection Print by Babs Gaillard, c. 1980s. The Herb Cottage (1904) is the oldest building on the National Cathedral grounds. Originally intended as a Baptistery, the cottage has served several other functions over its lifetime, including a gift shop until 2011. Babs Guillard specialized in pen-and-ink sketches of the Cathedral and its environs. She was a board member of the women’s charitable group, the All Hallows Guild, which operated the Herb Cottage shop. Its proceeds supported the upkeep of the Cathedral gardens and grounds. 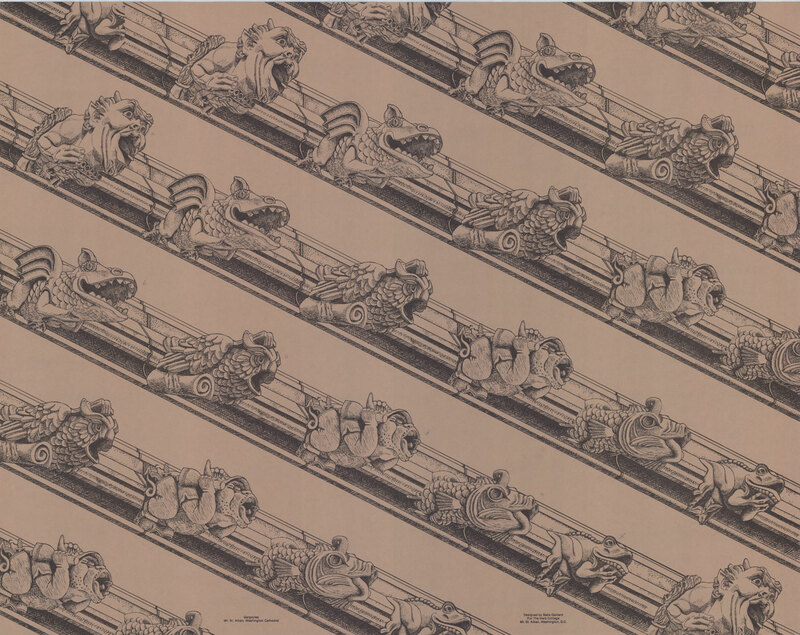 Her drawings were used in the Guild’s published materials such as tour maps, shopping bags, newsletters—and the wrapping paper above. You can spy this “Happy Face Monster,” a dragon-like beast, as a gargoyle sculpture on the Cathedral. Sketch by Heinz Warneke,Washington National Cathedral Collection, 20th century. 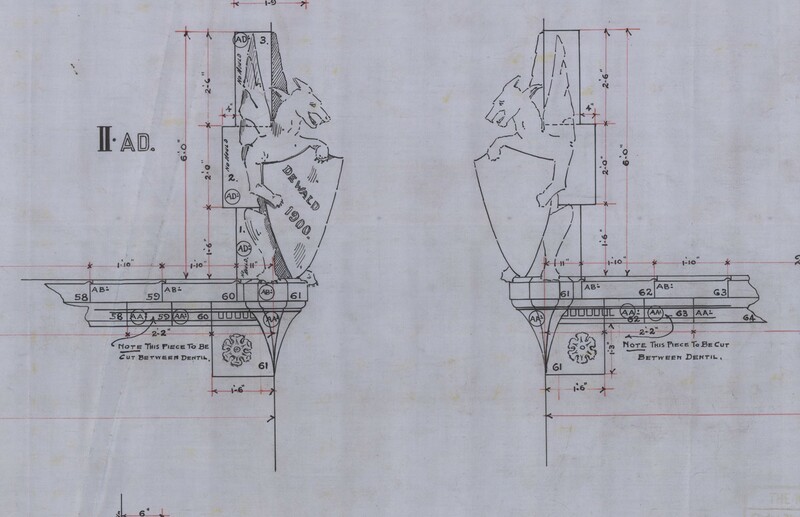 This drawing of St. George was designed to decorate a supporting corbel in the National Cathedral. The slaying of a dragon, (and the figurative defeat of evil), was a mythical story long before its incorporation into Christianity. Its association with St. George was popularized by The Golden Legend, compiled in the 1260s. The tale recounts a dragon terrorizing a city in Libya and demanding human sacrifice—eventually that of a princess. St. George kills the beast, but only in return for the residents’ religious conversion. Wurts Brothers Photograph Collection, 1931. 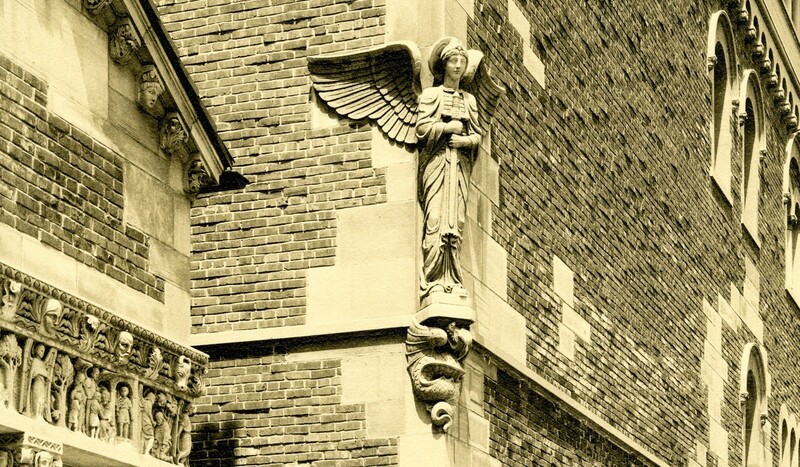 Church of the Guardian Angel (New York) with dragon ornament. The Sicilian-Romanesque Church of the Guardian Angel and its adjacent parochial school boast an array of animal-inspired sculpture. Look closely to spy the winged ox of St. Luke, a horse or donkey, heads of a lion and ox, and a dragon supporting a winged figure, possibly St. George. 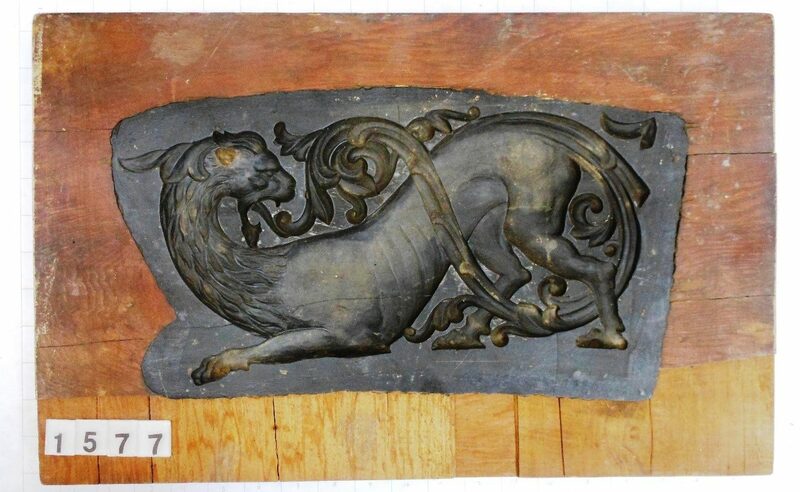 In contrast to Western iconography, dragons in China and South Asia are revered as benevolent beasts that hold an auspicious place in philosophy and the zodiac. In medieval Islamic art, the dragon often appears in art and architecture as a complex dichotomy of both good and evil forces. 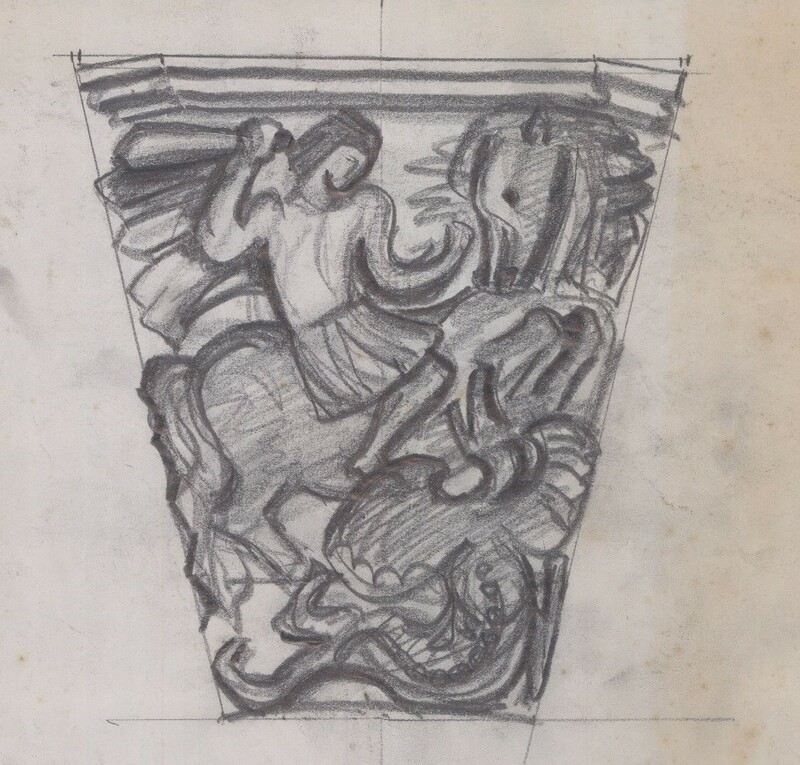 Drawing, DeWald & Kaag Grotesques, Northwestern Terra Cotta Collection. Fort Wayne, Indiana (demolished), 1900. As confirmed by this Northwestern Terra Cotta drawing, the finer structure was indeed built the following year. Two dragon grotesques (purely decorative embellishments that do not function as waterspouts like gargoyles), appear on the second floor cornice. In Western tradition, dragons breathe fire and are protectors of valuables. Perhaps Kendrick had the demise of the former DeWald & Co. in mind as he designed its replacement. 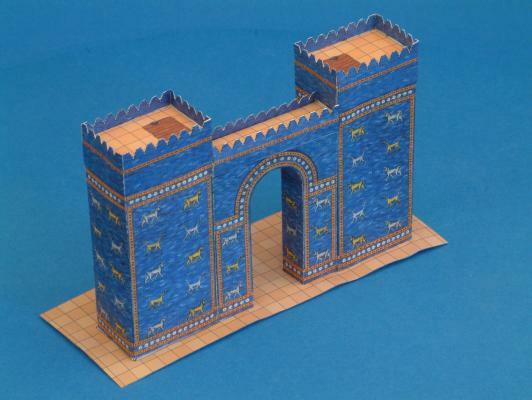 Ishtar Gate, Paper Model Collection. Published by Aue Verlag, Möckmühl, Germany, 1999. Babylon was partially excavated by the Germans in the early 20th century. 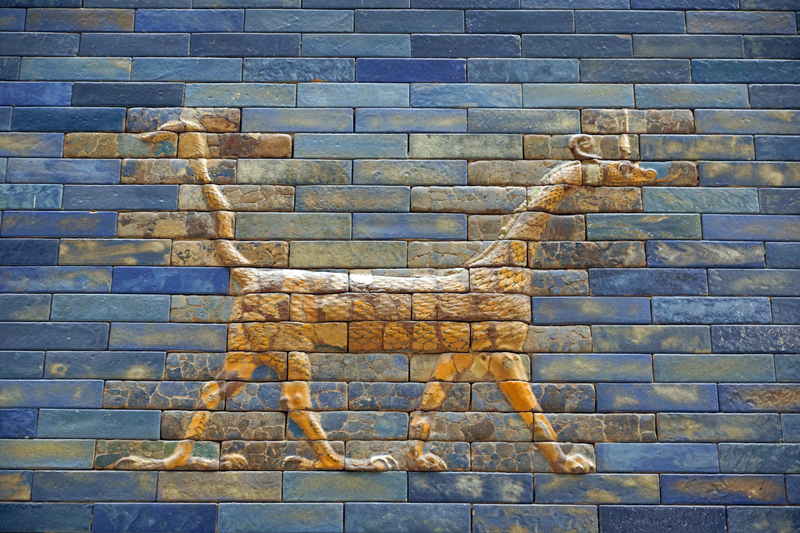 The original Ishtar Gate was transported to the Pergamon Museum in Berlin in 1930 and reassembled. In 1987, Saddam Hussein built a smaller replica of the Ishtar Gate and damaged the archaeological site by attempting to “rebuild” his own Babylon on top of it. Learn more about these mythical creatures and more in Animals, Collected, opening April 20.